Enter Calibre® xACT 3D—a new product designed to provide the reference-level accuracy of a 3D field solver coupled with fast performance and high scalability. Calibre xACT 3D leverages its integration into the established best-in-class production design sign-off flow with Calibre LVS and its device and interconnect modeling infrastructure for maximum usability. 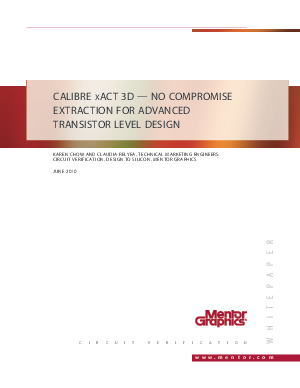 This paper details how the Calibre xACT 3D extraction solution addresses the extraction challenges for design signoff at advanced nodes.